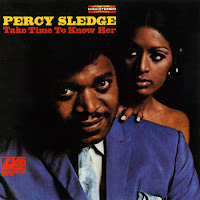 1967 continued for Percy Sledge with "Cover Me", a fantastic new song written by Eddie Hinton and Marlin Greene. Despite its strength, it only charted at #39 R&B and #44 pop. However his next single proved to be one of his biggest hits - "Take Time To Know Her", a country-soul ballad from the pen of young Nashville songwriter Steve Davis, reached #6 R&B and #11 pop in 1968. His fourth album followed, featuring both songs and a great selection of others, including "Feed The Flame" by Dan Penn and Spooner Oldham, "Spooky" by The Classics IV, and "Sudden Stop" by Bobby Russell (which also saw release as a single, getting to #41 R&B and #63 pop). It also found room for two hits from the year before, "Baby Help Me" and the superb "Out Of Left Field". The result was a very strong album (perhaps his best), but it turned out to be his last in quite a while. Though he continued releasing singles on Atlantic Records over the next few years, none of them would chart particularly well, and Atlantic released no new albums bar a greatest hits package.